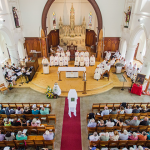 Lasting tribute: Townsville diocesan administrator Fr Mick Lowcock addresses the congregation at the funeral of former Bishop of Townsville Bishop Raymond Benjamin in Townsville’s Sacred Heart Catrhedral on March 17; and (above right) the bishop’s coffin at the steps of the sanctuary. 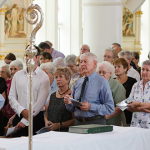 THE late Bishop Raymond Benjamin was a much-loved leader of Townsville diocese, and during his Vigil and Sharing of Memories people paid tribute to him and told many stories of the wonderful man. 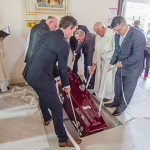 Bishop Benjamin, the fourth Bishop of Townsville, was buried on March 17 in Sacred Heart Cathedral, Townsville. He died on March 7. Fr Terry Lyons, a priest of the diocese who celebrated his golden jubilee last year, spoke about his time with Bishop Benjamin. “This is the first quality I found in Bishop Ray Benjamin,” he said. “He was indeed a friend to his priests, someone who always welcomed them and welcomed them with trusting familiarity; he was certainly that. Family members also spoke about their loving relationship with Bishop Benjamin growing up. Nephew Gerard Benjamin spoke about spending school holidays with him in Rockhampton and how he taught him chess and showed him the sights of Rockhampton. “Even as a boy I registered his calm authority, his tremendous breadth of interests, his passion for music, his thoughtful discussions and his ability to talk to anyone,” Mr Benjamin said. One of Bishop Benjamin’s passions was for the indigenous, and Colleen Muckan, the original chair of the Diocesan Aboriginal and Torres Strait Islander Pastoral Council honoured Bishop Benjamin. She said he was “a great man, a great leader and a great shepherd – a man who always honoured others in his life”. “He walked with the Aboriginal and Islander people; he was a great priest and he walked the road of justice with them and honouring them,” she said. Laid to rest: Bishop Benjamin’s coffin is lowered into a tomb in Sacred Heart Cathedral after his funeral Mass. 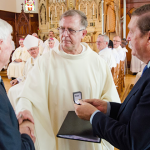 Family memento: Fr Mick Lowcock presents Bishop Benjamin’s brother Bernard (left) and nephew Gerard with the bishop’s episcopal ring. Shared grief: Mourners gathered at Sacred Heart Cathedral for Bishop Benjamin’s funeral. 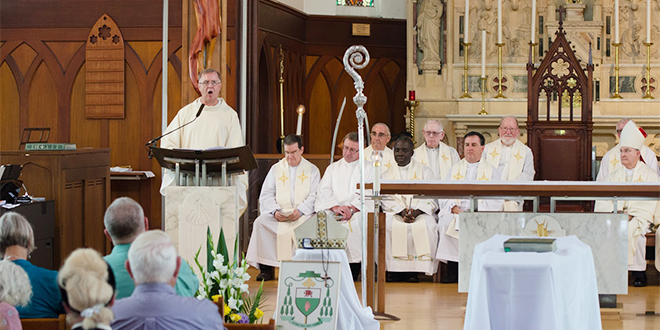 Lasting tribute: Fr Mick Lowcock adresses the congregation.